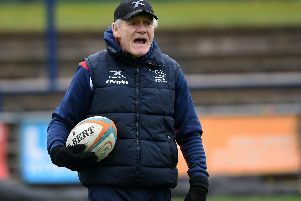 Doncaster Knights director of rugby Clive Griffiths is ‘working from home’ following heart surgery last month. The 64-year-old had a stent fitted after suffering a heart attack whilst out jogging. Griffiths is doing light work, such as player recruitment and providing video analysis of future opponents, from home. Knights have lost five on the bounce and sit third bottom of the Championship but produced an encouraging display against title favourites London Irish last weekend. “I’m busy trying to get players in,” said Griffiths. “There will be players coming in – both on permanent deals and on dual-registration - and I am working on that now. “I can’t just sit still doing nothing and doing what I’m doing is helping to take my mind off things. “I’m getting better now six weeks down the line. Obviously you worry about it happening again but what everyone keeps telling me is that I’m in a better position for having the stent put in than I was before. “When I do start back at the club it will initially be a more director of rugby role rather than a track-suit (defensive) coach. I’ll be out there watching the sessions and having an input but I won’t be running around like I was for a while yet. Knights will lack the services of a number of regulars for the most of November due to international call-ups. In-form No 8 Josh Tyrell (Samoa), second-rower Nick Civetta (USA), fly-half Kurt Morarth (Tonga) and scrum-half Henry Seniloli (Fiji) will all miss the opening fixtures in the club’s inaugural Championship Cup campaign which kicks-off on November 10 at home to promoted Coventry. Griffiths was at Castle Park on Saturday – his third such visit since his operation – to watch Knights take on unbeaten London Irish. “I had a lot of mixed emotions at the end,” he said reflecting on the 26-17 defeat at his St Helens home. “I felt proud of the performance, especially the fact that we won the second half 7-0, but at the same time I was disappointed that we didn’t get anything out of the game.